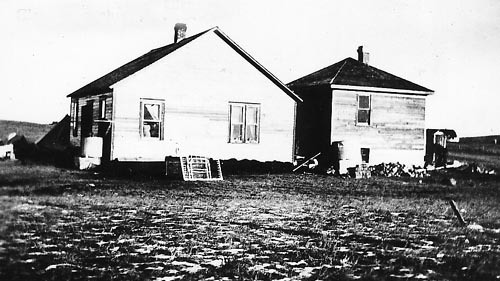 In 1909 Porterfield Robinson arrived in the area and established the first post office where settlers believed the CPR Moose Jaw-Lacombe line would go. 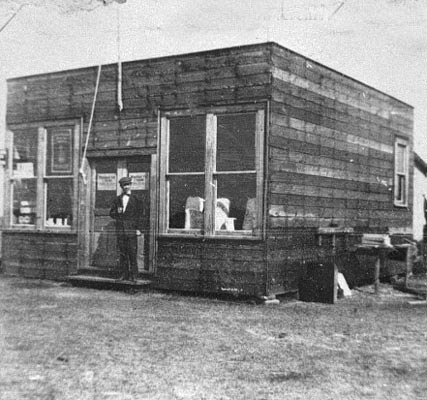 He built a store to bring in supplies for the settlers from the nearest railway point, Macklin, SK. A survey had been made, but it was still a question. 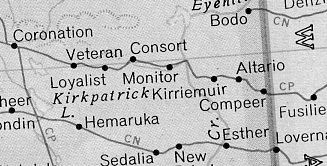 Steel had been laid as far east as Stettler. Robinson named the settlement site "Wilhelmina" after his daughter. In August 1914, the rail line came in from the west, four miles north of Robinson's site. The CPR moved a boxcar in, to serve as a station. But the first building in the new hamlet was the lean-to part of Porterfield Robinson's store, which he moved from Wilhelmena with the help of R. H. Bartels and his four Percheron horses. The town was renamed Bideford (the government said Wilhelmina was too difficult to spell), then Saskalta, and the name was subsequently changed again, to Altario. Robinson's Department Store was followed by John McLeod's Hardware store, the pool hall, the Chinese restaurant, the garage, and other places. Porterfield Robinson kept on being postmaster, and he also ran a farm machinery agency, and sold coal and oil. There was a livery stable run by Mr. Oxton, a pool hall, other farm machinery agencies, a notary public, doctor and a dentist. 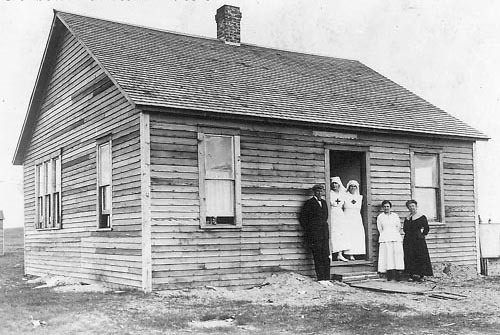 In April 1920, the first Red Cross hospital was opened, with Dr. Dean Robinson as the doctor. He was later joined by his brother-in-law, Dr. W.W. Almond, husband of Wilhelmina Robinson. Dr. Leslie Robinson returned to Altario from McGill where he studied dentistry, and had his dental office in the annex of MacLeod's hardware. The first teacher, Miss Milliken, arrived on May 7, 1916. Jack Ehaust built the first and only blacksmith shop in Altario.